A chronicle of discovering and coming to terms with my baby being diagnosed with Williams Syndrome. Oh, my friends! My loves! The day that I was waiting for is finally here! I’m absolutely delighted to announce that my first book, a short story collection titled Beautiful Sorrows, will be out next month! If only you knew how excited I am. Maybe you could think back to your first book, or dream ahead to it, and then you’d know. I can’t stop smiling. Shock Totem Publications is putting it out, and I’m astounded at how much work and care they’ve put into this. It’s humbling. Please read the official announcement here! 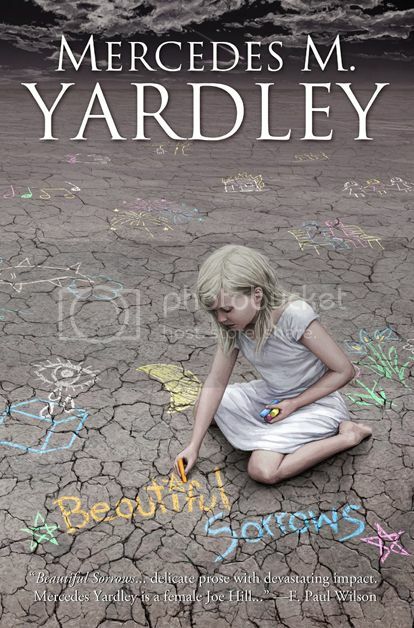 And check out the beautiful cover art. I think it’s perfect. Have a great day! Is Strapping The Boy Down Really The Answer? Apparently So. This is my kidlet. He’s nine, he’s frickin’ adorable, he has Williams Syndrome, and he’s unruly on the bus. He just can’t sit still. Last year the bus had an aide and that was all that was needed, but this year transportation has gone completely insane. The budget cuts are astronomical. It’s impossible to get an aide for him; I know because we asked. Repeatedly. We were trying to avoid the “Hello, Mama, the police brought me home!” thing again. This is the answer: A weight vest. At least, it’s what they call a weight vest, because that definitely isn’t what this is. A weight vest is, of course, a vest that is weighted. It can be specially made, or it can be a fishing vest with beanbags in the pockets. The idea is that the extra weight will make the child feel secure. 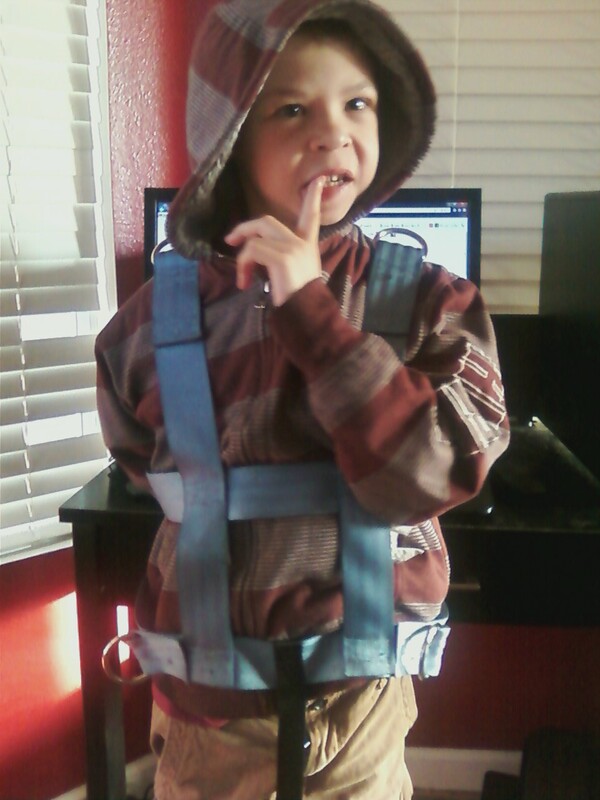 And it works, because Niko has used weight vests for years and did very well with them. This, however, is a harness. The metal hoops on his shoulders clip to an apparatus that is securely fastened to the bus seat. There are metal hoops on each skinny hip, as well. It zips up the back and buckles between his legs like a parachute harness. Oh, he hated it at first! How he screamed! It was absolutely heartbreaking. As time went on, he became more used to it. I’m trying to do the same. It’s very nice to know that he’s secure in his seat and that he won’t be running pell mell on the bus, and it’s especially nice to know that the next knock on the door won’t be Las Vegas Metro handing over my little one. It’s still very difficult to physically strap him down every morning. But that’s life, yes? Take the bad and celebrate the good. At least my son is so gosh darn charming! *UPDATE* I wrote this post a long time ago (hence the coat. It’s a bazillion frickin’ degrees outside right now! A coat? No way!) and we’ve had time to adjust to the harness. 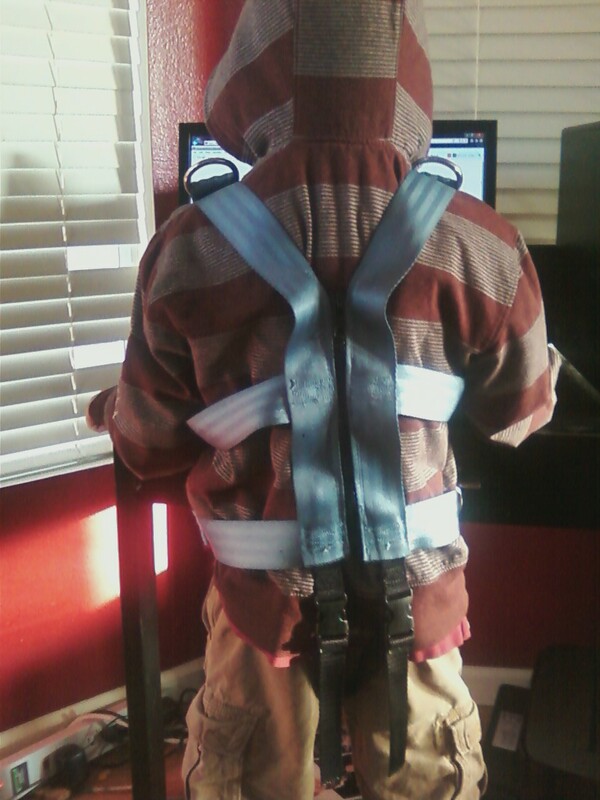 It no longer frightens him, and he actually seems to feel very secure wearing it. It took a few months to get to the point that we’re at now, but with consistency and adding it to his daily routine (“Go potty, wash your hands, and then we put on the harness!” we’re at a great place with it. I’m glad we have it, especially since he’s been watching youtube videos on learning how to drive school buses. Dodged that bullet! Some of you know that I'm working on a memoir about Niko and our journey with Williams. Jay Faulkner was kind enough to let me share a chapter of it on his blog. This is chapter three and it has to do with how we reacted at the time of dignosis. Won't you please read it? And if you have the time, will you tell me what you thought? The memoir is on the back burner at the moment because I was a little too close to it, but I may be ready to start again. I have to tell you, dear ones, that I have never stalked into a meeting so ready to fight, and then...I found that I didn't need to. Niko's IEP meeting was on a ridiculously tight schedule. We had about an hour to complete the entire thing, so I basically walked in and said, "We feel that this isn't the right placement for Niko. Although wary about the autism placement, it's preferable to here. We'll reassess again at the end of the school year. Enough of that. Let's talk about the abuse allegations that I'm hearing about." Their jaws dropped. DROPPED. They were absolutely horrified. We looked at their faces and realized that they genuinely didn't have anything to do with it. I shared the information that I had, told them who I was warned about, and demanded that the earlier abuse allegations be documented and put into his folder immediately. They did so while we watched. And then there was smiling. They held sweet Lil' Lil. We talked about how amazing Niko's speech is coming along, and how best to control his extreme anxiety, and how much he wants to please us. We discussed his mind-boggling aggressive behavior at school (kicking, hitting, singling out victims) and how that behavior was nonexistent at home. When they gave him his own floater aid, the violence dropped to nearly nothing. He had 17 kids in his class, and it was too much. The autistic placement turned out to be a godsend. It wasn't right for him before, and we made the best choice at the time, but right now he is thriving. It's delightful to receive notes from his teacher saying, "Did you know that he knows his colors?" She constantly tells me how well he responds to ABA therapy. 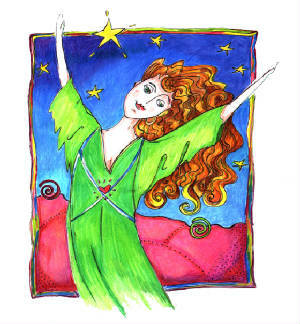 She uses words like "delighted" and "amazed" and "impressed". There was a bus snafu (okay, so there were many) and his teacher swooped in, fiercely protective of him, even though he has only been in her class for a few weeks. She's truly playing for Team Niko. He's happy. He comes home humming new songs that I'm not familiar with. He asks to go to New School. He's himself again. So Niko hates school. I know, right? He's usually wild about school. Mad about school. Last year he loved his teacher, loved the bus, loved his homework. This year he cries. Suddenly I hear that he's aggressive. Each morning he begs, "Mama home?" and wails while I put his clothes on. You know me. You know where my mind goes. As soon as I heard that he was assigned to the same school where he was "allegedly" abused before, I stood my ground until he was switched to a different school. YAY! But he's regressing in potty training, even at the new place. He's changing. We have an emergency IEP meeting scheduled for tomorrow. They, once again, feel like he would do better in an autistic placement. I'm not certain how I feel about that placement, but I know for sure that he is NOT thriving where he is now. But I was just pulled aside and informed that I should "check Niko for marks". That two kids in the special ed department from his new school have pulled their kids out. Nobody should have to check their kids for marks as soon as they step off the bus. The meeting is tomorrow. My husband took work off so we can attend together. It isn't going to be how it was last time. I'm not going to weep and cry and shudder to the ground. I'm going to dismantle everything if I have to. Scream the walls down. Call the media. Carry a fiery sword and defend our children. I also found out that the schools have no record of the abuse that went on before. They have record that they suggested an autistic classroom for my non-autistic son and I stubbornly refused, but no record that an earlier teacher put her hands on him. Repeatedly. With witnesses that refused to speak up when interviewed later. This will change. All of this will change. This is mostly because I have changed. I'm not going to be intimidated anymore. I'm going to look this broken system in the eye and say, "I'm stronger than you." Oh my goodness, have I really not updated since MARCH? I don't even know what to say. Life was busy, I guess. I updated the other blog more regularly. I've been happy and sad and stunned and baffled. Let's make a long story short, shall we? I was on bed rest for about three months. The twins came as a very sudden surprise and were born about eight weeks early. We named them and held sweet Seija in our arms while she passed. She lived about five hours. Lilia is still in NICU and has been there for about six weeks. She's having difficulties with her heart and with breathing, but she's absolutely beautiful and a joy. I'm having difficulty with being the mother of five children but only three are alive, and one hasn't even been able to see sunshine yet. There are good days and bad days. Some of you know that Niko was "allegedly" abused by his special education kindergarten teacher. 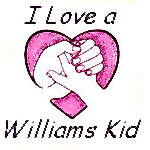 There was a slapdash investigation by the school district and the teacher had to take a class on Williams Syndrome. She still teaches there. I was not satisfied with the outcome, but was too heartsick and naive to do any better than I did at the time. (If you want to read about that situation, it starts here. Seriously, I read it and felt nothing but sympathy and sorrow for sweet, befuddled me.) I received a letter saying that Niko was assigned to that same school for this school year. I can't believe that even happened. I get to call them tomorrow and tell them in no uncertain terms that my son will NOT be going back to that school for any reason, and to change his assignment immediately. I'm filled with equal parts rage and sorrow, but I realize that I'm much stronger than I was just a few years ago. He is my son, and he's beautiful, and he deserves so much more than he's being given. He isn't an afterthought, and I'm not afraid to stand my ground. Wish us luck. Every time I go to the doctor, the news has been bad. One of the triplets died. One will most certainly die. When the second one passes, it could very well take the third with it. Well, enough of that! Today we received wonderful news. Although sicky baby will almost certainly pass away soon after birth, for the first time we’re looking with optimism toward meeting her. The doctor was surprised at how well she was doing. “Delighted” was the word that he used, and I’m delighted as well. She’s doing so well that there isn’t a reason not to expect her to survive until birth. The other baby is doing extremely well, also. Hooray! Now I can definitely spend the day writing with a lighter heart.